On 27.07.2018, a system of environmental badges with 4 categories of different colours was officially introduced in Spain . These categories are based on the quantity of emissions and the year of registration or the EURO class of the vehicle. 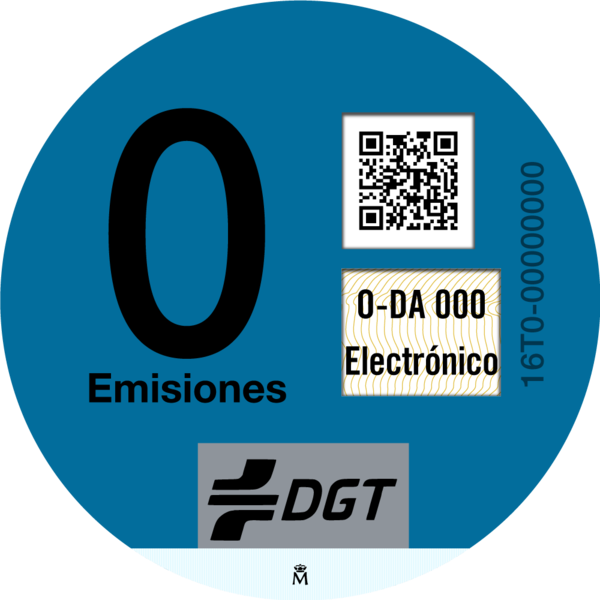 The environmental badges introduced and issued by the Spanish National Traffic Authority (Dirección General de Tráfico /DGT) aim at distinguishing environmentally friendly vehicles from polluting ones. With this system and the Spanish environmental zones introduced at the same time, the emissions of nitrogen oxides (NOx) and particulate matter will be reduced in Spanish cities. 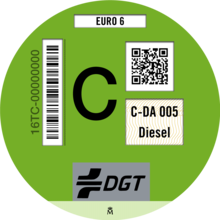 For this reason, the DGT already laid a detailed foundation on 07.04.2015 with the directive 15/V-110 on the classification of vehicles and the zero emissions badge, which contained detailed specifications. The complete distinction of vehicle types, according to the categories of the Spanish environmental badges, such as two-wheeled motor vehicles, cars, trucks and buses was then regulated in the PCI/810/218 ordinance of 27.07.2018 and in the resolution of 13.04.2016, its basis was already established in the National Air Quality and Protection Plan for 2013-2016 (2.6 MB). 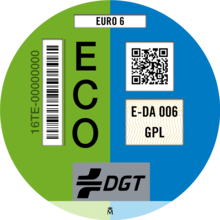 The environmental badges printed by the National Printing House (Fábrica Nacional de Moneda y Timbre) and issued by the DGT, are officially called Distintivo Ambiental and are divided into the 4 different categories 0, ECO, C and B. 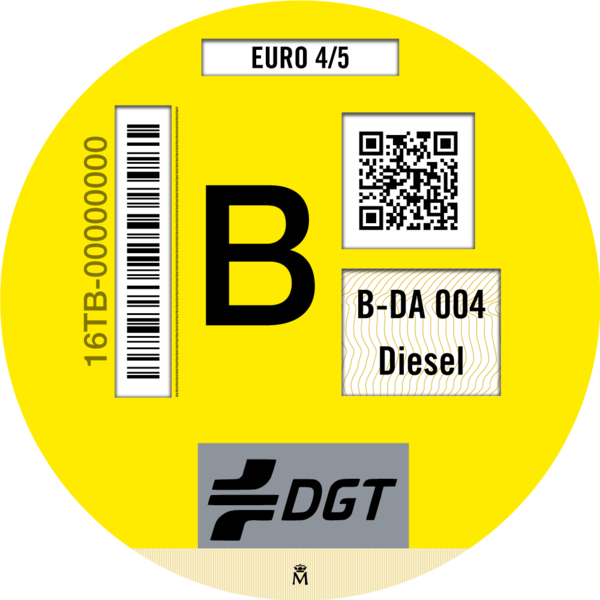 Category A, for which there is no badge, includes all vehicles and EURO classes that have not been classified in any of the other 4 categories. 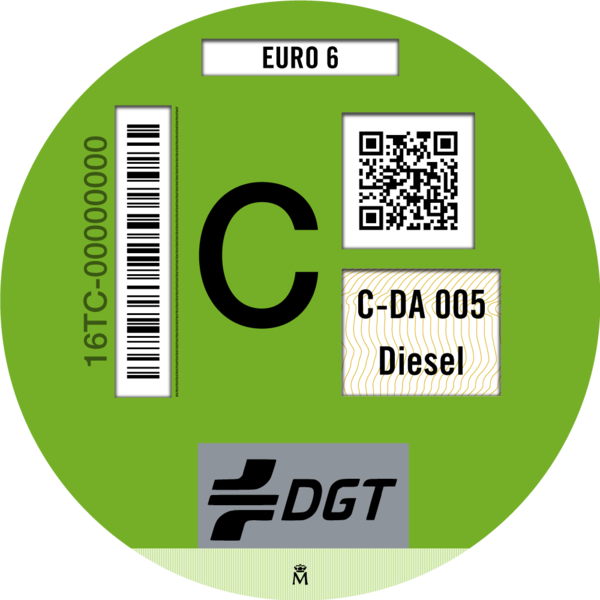 According to the DGT, which manages all vehicles registered in Spain and their emission classes, category A includes around 19.9 million vehicles, which do not receive a badge. This represents 58.3 % of the total Spanish vehicle fleet in October 2016. Of the 14.23 million vehicles that receive an environmental badge, around 21,350 belong to category 0, 110,750 to category ECO, 9,987,000 to category B and 4,110,000 to category C. An overview of the vehicle types can be found in the table here showing all the EURO classes and the years of registration that receive a Distintivo Ambiental. Vehicles registered in Spain have already received the Distintivo Ambiental automatically and without costs in several phases from the National Printing House (Fábrica Nacional de Moneda y Timbre). From March 2015, car owners of category 0 received their blue Distintivo Ambiental by post. 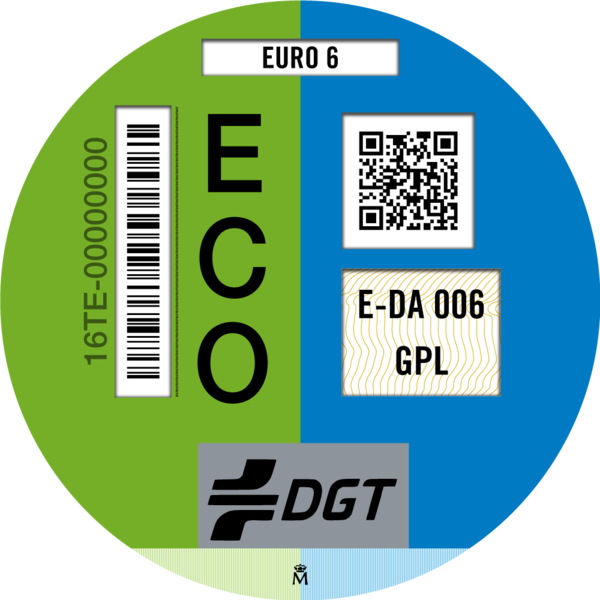 Afterwards in July 2016 they received the blue/green ECO badge by post. Since October 2016, 4.3 million B and C category badges were sent to car owners in the 5 largest regions: Madrid, Barcelona, Granada, Seville and Valencia. In 2017, the remaining 9.8 million badges of categories B and C were sent to the rest of Spain. In April 2018, the DGT then classified the lightweight vehicles such as mopeds, motorcycles, etc. into the 4 categories announced in a press release. Affixing the Distintivo Ambiental to the vehicle is voluntary. Owners of vehicles registered in Spain who have not received their Distintivo Ambiental or have lost it, can receive a new badge by purchasing it at specific post offices in Spain. For newly registered vehicles that meet the criteria for obtaining a Distintivo Ambiental, the badge is handed over together with the new vehicle registration document. 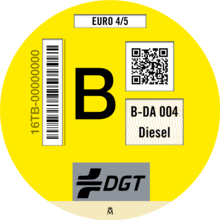 For vehicles registered outside Spain that cannot be registered with DGT, the procedure for obtaining a Distintivo Ambiental will be announced in due course.